Great Impressions: It's time to Celebrate!! Hello friends! Have you seen the new look of our blog? Isn't it fantastic! I love it! Have you seen our big BlOG CANDY post? Check it out right here for your chance to win! So, in honor of our new blog look, I decided to make a happy card to celebrate! This card is super cute and very easy to make. 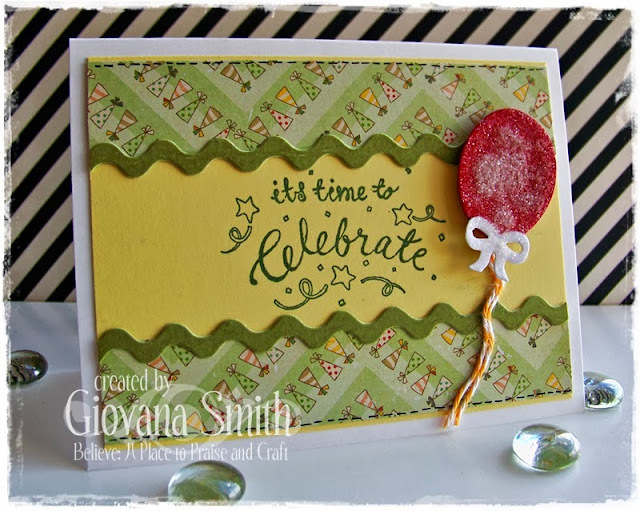 For this project I used the "Time to Celebrate" sentiment. Cut a panel from Yellow Cardstock (5" x 3.75"). Adhere a couple of strips of Patterned Paper to top and bottom (1" x 5'). Die-cut ric-rac border from cardstock and adhere it to panel. Stamp sentiment in Olive Archival Ink. Die-cut balloon and bow, glue them together and adhere them to card adding twine. Add crystal lacquer and glitter. Finally add faux stitches using a black liner pen.